The St. Francis Prep community welcomes Mr. Victor Kebaki, Principal, and Mr. Jacob Kihara, Science Department Chairperson, from our partner school St. Francis, Lare, Kenya. Both will be visiting the United States for the first time and learning about our educational system. Bro. Leonard Conway, O.S.F., SFP President, has arranged and scheduled an exciting and informative week for them. We wish them all the success and welcome them to Fresh Meadows! Once again, St. Francis Prep marched up 5th Avenue on Saturday, March 16th, as part of the Annual St. Patrick's Day Parade in New York. Prep Alumni, Students, Family, and Friends fell into formation at West 46th Street. St. John’s University awarded Mr. Melendez of our Religion Department with the “Outstanding Adjunct Faculty Award” this year. Congratulations and well done! 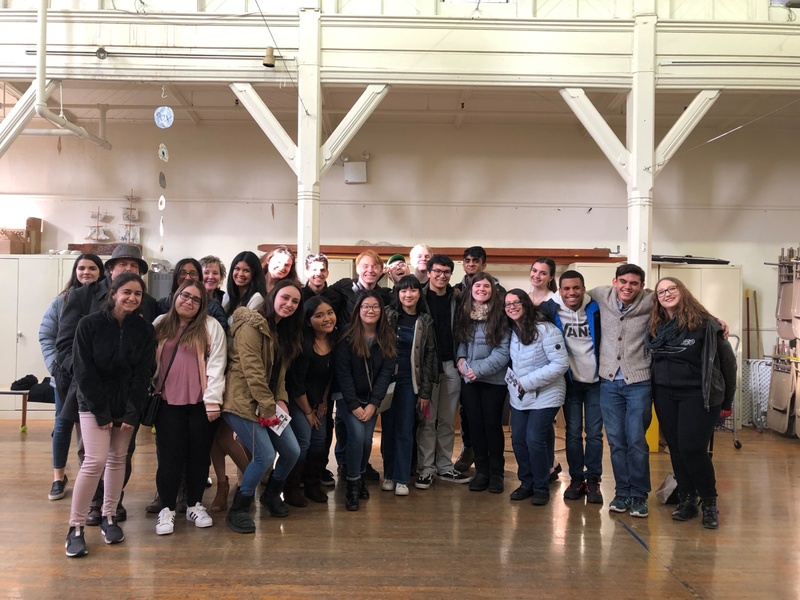 On St. Patrick's Day, a group of Ms. Prohaska's AP seniors took a trip to see Rosencrantz and Guildenstern Are Dead at a local theater in Brooklyn Heights. The class had just finished reading the play. The performance was fantastic. Mr. Paccione attended to help chaperone. We have nothing but good things to say about the Heights Players! It was a great experience for everyone. 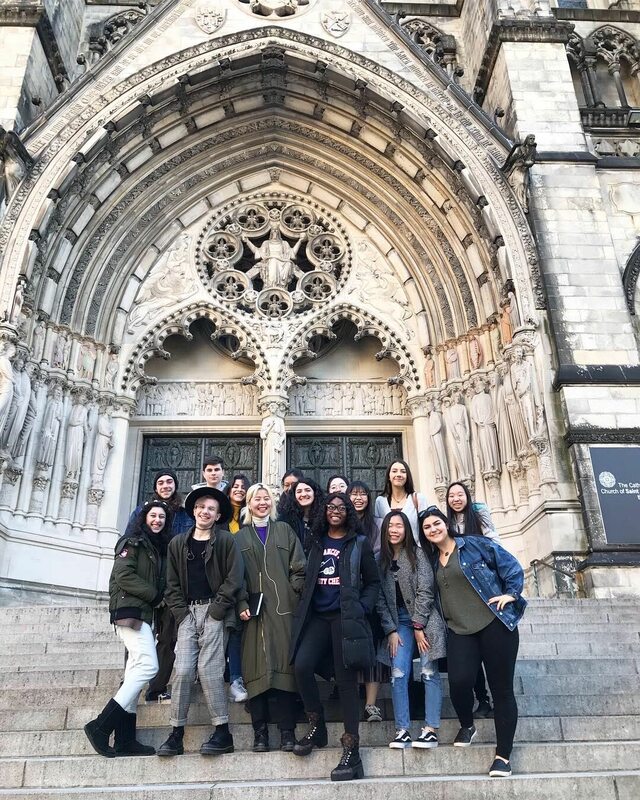 On March 13th, 2019, Ms. Shmerykowsky and the students of AP Art History ventured into Manhattan for an amazing experience of religious art work. First we visited St. John the Divine, a modern-day Gothic Cathedral on 110th Street. St. John the Divine is one of the largest churches in the world. To see such a massive structure, which is still under construction, among the modern constructions of New York City was breathtaking! For the students to see the high vaulted ceilings, the stained glass and rose windows, the massive piers, and the vast nave was an experience in itself! Before the students walked around the cathedral's main floor, we all took part in a vertical tour. On this adventurous climb, we went up 124 feet through spiral staircases. On each level, the students learned about the stained glass windows and sculpture and were able to study the architecture of the Cathedral while standing on a buttress and in the “forest,” which is the space between the ceiling and the roof. The tour ended with a beautiful view of Manhattan from the roof. Our next stop was to the MET Cloisters. There we viewed a variety of religious icons, statues, tapestries, relics, paintings, and manuscripts of the Romanesque, Medieval, and Gothic styles. In both locations, the AP Art History students were able to witness first hand many of the art works they study in class. Seeing something in person is such a valuable and precious experience. We are so grateful to be living in a city where some of the greatest examples of art and architecture are only a bus ride away. This was a successful field trip that allowed the students to gain further appreciation for the arts, architecture, history, and religious imagery. The Scholastic Art and Writing Awards are presented by the Alliance for Young Artists and Writers. The Alliance is a nonprofit organization whose mission is to identify students with exceptional artistic talents. Through the Awards, students receive opportunities for recognition, exhibition, publication, and scholarships. In February, the names of all of our winners were announced by Scholastic Art and Writing Wards. We had five Gold Key winners, four Silver Key winners, and nine Honorable Mentions. Some of our winners had multiple art works chosen and, in the end, we have 28 awards given among 13 students. We also recently received word that we have one National winner, Jinghong Chen, who received a Silver Medal for her artwork. On Friday, March 22nd,2019, our Gold Key winners had the amazing privilege of seeing their art work displayed in the Ruth and Harold D. Uris Center for Education in the Metropolitan Museum of Art in New York City. Winning the award is an amazing accomplishment, but to be able to say your art work is hanging in one of the most famous museums of the world and among the greats of art history is truly phenomenal. Our Gold Key recipients are Jinghong Chen, Yejin Kim, Allison Lau, Kasper Bielecki, and Charlize Ruiz. The exhibition from March 22nd to May 27th, 2019. On Sunday, March 24th, both the Gold and Silver Key recipients gathered at The New School in New York City to receive their awards. Each student was able to come onto the stage of the Tishman Auditorium and hear their name and awards announced. This moment in the spotlight is a beautiful way to tell everyone in the auditorium what they have done in the name of art. In addition to the names of Gold Key winners mentioned above, the following students also received Silver Keys recognition: Victoria Reshetnikov, Dongtianyi Zhao, and Dian Wang. The Art Department is extremely proud of the hard work, dedication, and amazing talent these students have demonstrated. Their artwork speaks volumes of their skills, techniques, and personalities. Congratulations to all our exquisite artists! 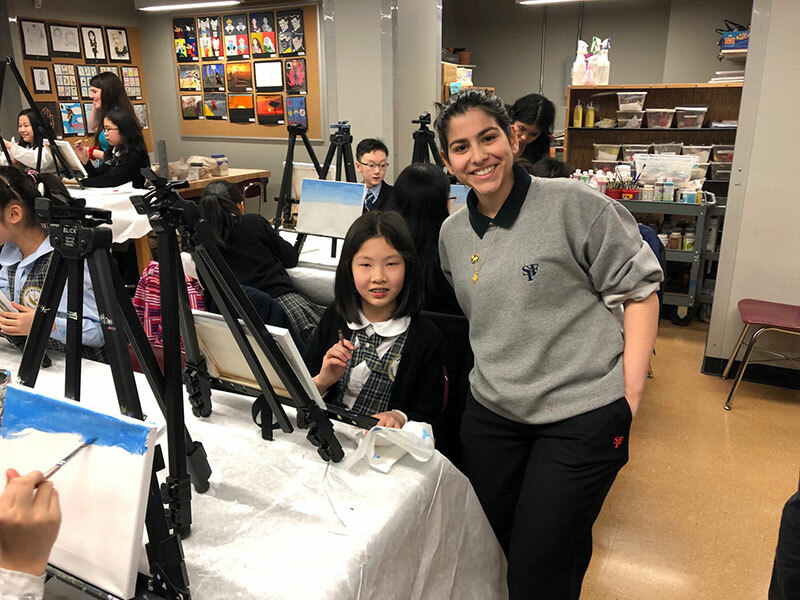 On Monday, March 25th, SFP welcomed nineteen students from Saint Michael’s Catholic Academy for an afternoon of painting. Students from the National Art Honors Society wanted to work together on a project to help the community. After speaking to Campus Ministry, the details of the service project were finalized. “I was aware that Saint Michael’s cannot afford an art teacher and that SFP has the best art program in any Catholic high school in New York City. Once the students asked how they can help the community, the partnership was obvious,” stated Dr. Sullivan, Director of Campus Ministry. 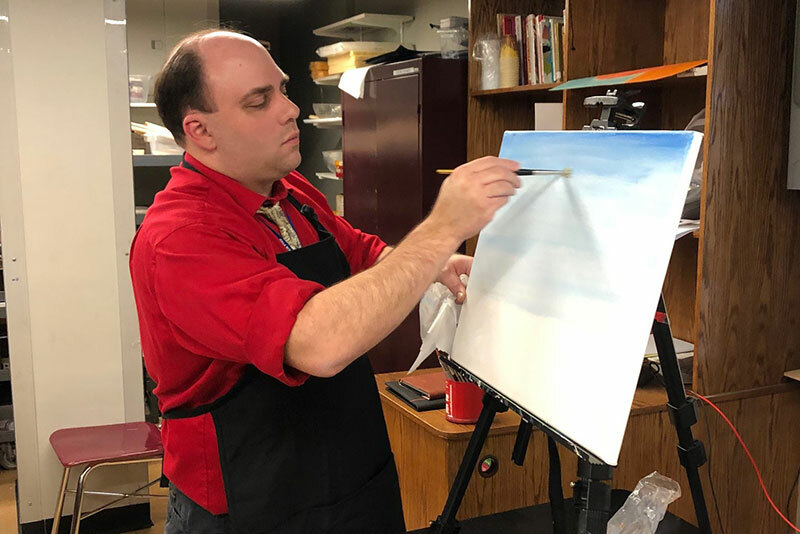 Mr. Anthony Biondolillo, ‘05, art teacher, created a lesson to teach the younger students how to paint a landscape. SFP students assisted the children by teaching how to blend colors, use the appropriate brushes, and create their masterpieces. 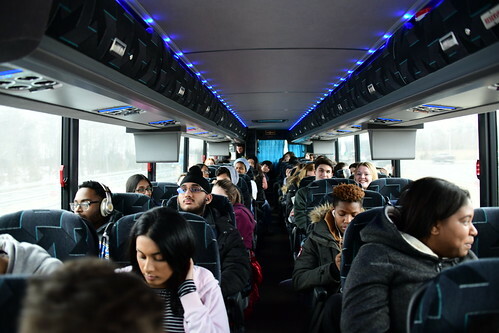 On Friday March 1- Saturday March 2nd, the AP US Government and Politics class went to Washington DC The students experienced many sights and took in the history of our nation. This year they were able to see the original Constitution at the National Archives, observe the changing of the guard at Arlington National Cemetery, visit the Vietnam Memorial and were able to experience the nations Capital with a tour of the building. This annual trip brings the AP curriculum to life for these students. On March 19th, four of our seniors were invited to compete in the final round of the New York City Science and Engineering Fair. Abigail Bossa came in Third Place in the Medicine and Health Science category for her project "Understanding the Regional Variability in Aged Human Brains." David Murtha came in Third Place in the Cellular and Molecular Biology category for his project "Generation of a RUNX1 lentiviral vector and applications to leukemia research." Vincent Smedile came in second place in the Physics and Space Science category for his work entitled "An Analysis of the Stellar Population of the Pleiades Cluster Using the Second Gaia Data Release." Finally, Alex Soohoo came in first place in the Behavioral-Sociology and Psychology category for his project "Developmental Evaluation of the Story Retell Task in Early Dementia Patients with Mild Cognitive Impairment." He also received the American Psychological Association Award for his work. We are so proud of the work that our seniors have done. Their work will be showcased at the 17th Annual Science Research Symposium on May 28th at 6:00 PM here at Prep. All are invited to attend to see the fabulous work that these students and their peers do. The Music department remains busy throughout the school year. In the last month, we presented our annual Jazz-Pop concert, featuring our top ensembles: Jazz Band, Honors Percussion Ensemble, Chamber Orchestra, and Chamber Choir. The night kicked off with the Jazz Band from The Divine Wisdom Catholic Academy, led by Anthony Russo. The night was hosted by Father Ralph Edel. As always, the night was a huge success, with highlights including Jazz Band's rendition of Tower of Power's, "What is Hip? ", Chamber Choir's "Wichita Lineman," Chamber Orchestra's reading of Led Zeppelin's "Kashmir," and Honors Percussion Ensemble's premiere of Dr. Marc Silvagni's medley from "Sonic the Hedgehog." On March 31st, Chamber Orchestra will be performing for Prep's annual President's Dinner. They will also be performing for the welcome assembly that will be greeting the Principal and Science chairperson from our twin school, St. Francis Secondary School, in Lare, Kenya, on April 1st. And on April 5th, Prep's Music Department will be holding our first ever National Association for Music Education Tri-M Induction Ceremony. Over 100 students will be honored. Ms. Kirsten Corwin is the Chapter Advisor, and Dr. Marc. Silvagni, the Co-Advisor. On March 24th, Prep was thrilled to host the 33rd edition of the Paul Effman Music Service New York Honor Band. Approximately 400 5th-8th graders participated, and 52 schools were represented. Finally, we hope you are all looking ahead to our annual Spring Concerts on May 3rd (orchestras, percussion ensembles, Concert Chorus), and May 10th (bands, Prep Chorus, and Chamber Choir). Both nights begin at 7:45PM, with doors opening at 7:15PM. General admission tickets are $5 and can be bought ahead of time in the Music office or at the door. 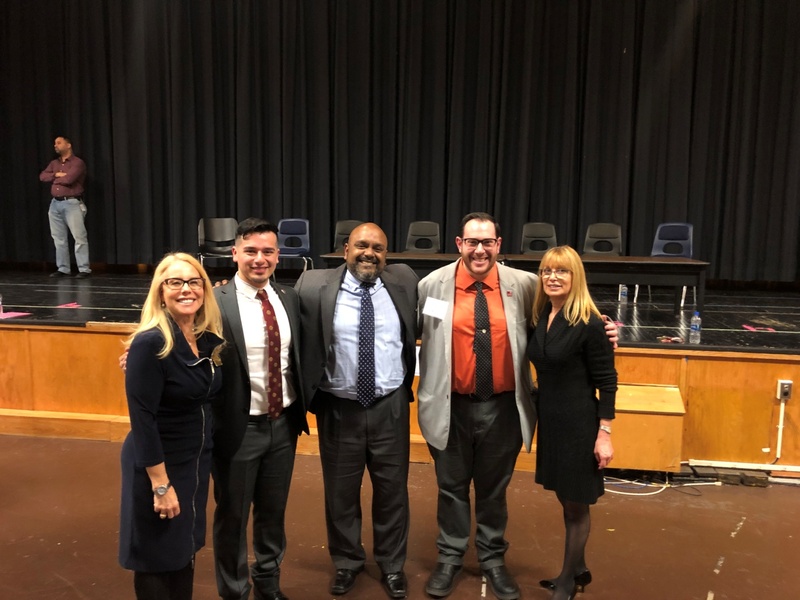 On Thursday, March 21, 2019, the St. Francis Prep Technology Alumni Chapter hosted a one-hour question and answer session entitled Clear out Cyber Clutter: It's Time for a Digital Spring Cleaning,led by Daniel Eliot of the National Cyber Security Alliance based in Washington, DC. Representing SFP at the event were some of the top students in our Computer Science division. 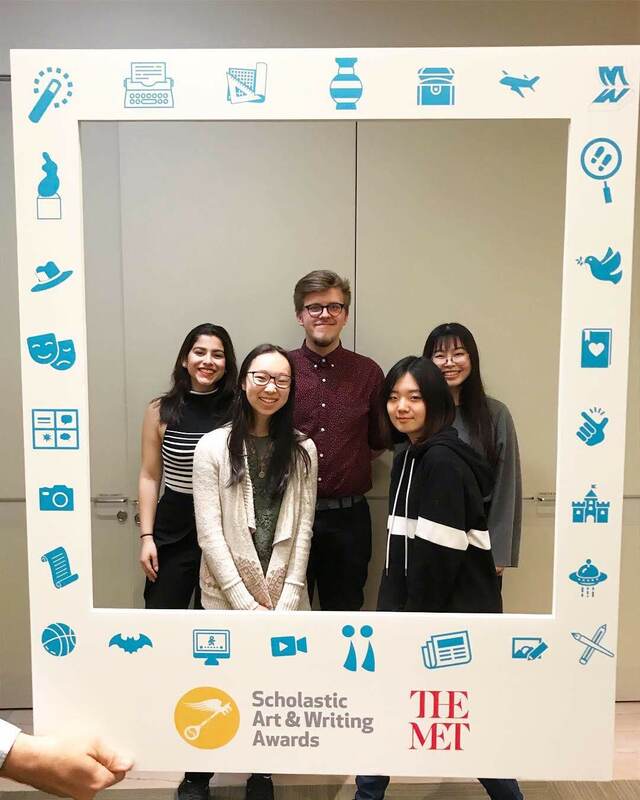 Seniors Laura Armellino, Alex Baraian, Kasper Bielecki, Aleya Boatwright, Fani Hatzidimitriu, and Marcella Hurtado mingled with alumni to discuss how the Prep has changed and how its teaching of technology has been adapted to the 21st century. They were led by Joseph Sciame, our chair of Computer Science and an alumnus (1978). 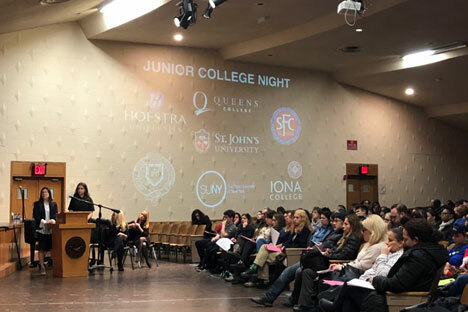 Tuesday, March 5, Prep held its annual Junior College Night in the auditorium. Over 500 families and students attended this special event. Representatives from the following schools were a part of our select panel: Richard Alvarez, Vice President of Queens College; Brian Rothstein, Director of Admissions at Iona College;Lisa Sayo, Director of Admissions at St. John's University; Sunil Samuel, Director of Enrollment at Hofstra; Pedro Ippolito, Associate Admissions Administrator at Fordham University; Rob Oliva, Director of Admissions at St. Francis College; and Maelin Adaris, Representative of Initiatives at SUNY. Senior students Rachel Luscher and Ana Pyo asked the panel questions sent in from our audience members. Ms. Robyn Armon, Director of Guidance and College Counseling, and Guidance Counselors Ms. Becky Barell and Ms. Josephine Morrone coordinated this successful program. Honorable Mentions: Henrik Israelian Cor 307, Joanne Gotanco Cor 407, and Vincent Smedile Cor 415. Best Delegate to Joshua Mathew Cor 411. 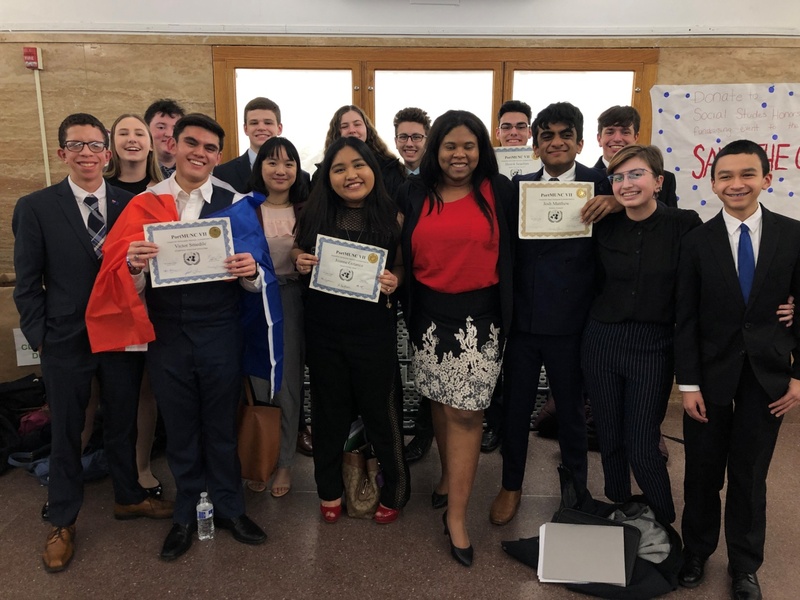 We want to thank our leadership Josh Mathews'19, Abigail Bossa '19, Joanne Gotanco'19, and alumna coach Kayla Keenan'18 for all they have done to make our Model UN a success. This is a good time if you would like to join the model UN. We meet every Wednesday after school in W014. We plan on finishing the year with a conference for new members and 8th-graders, a scrimmage with Hicksville high school, and a collegiate conference at Columbia University. Sandon Karinsky Cor 308 competed at the CHSAA swimming states championships at Eisenhower Park March 1st and 2nd. He was nominated for the best sportsmanship award out of all the CHSAA swimmers present at the State Meet. 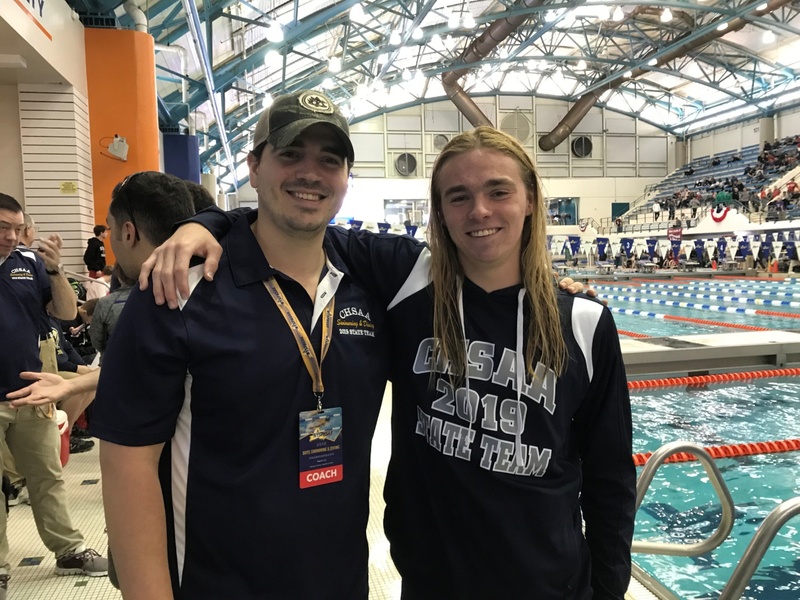 Sandon came in 8th in the State for the 50 freestyle event with a time of 21.21 and 10th in the State for the 100 butterfly. Congratulations to Sandon on this great accomplishment and his coaches Danny Finn and Maria Finn for their dedication and time all season! Go Terriers!!! 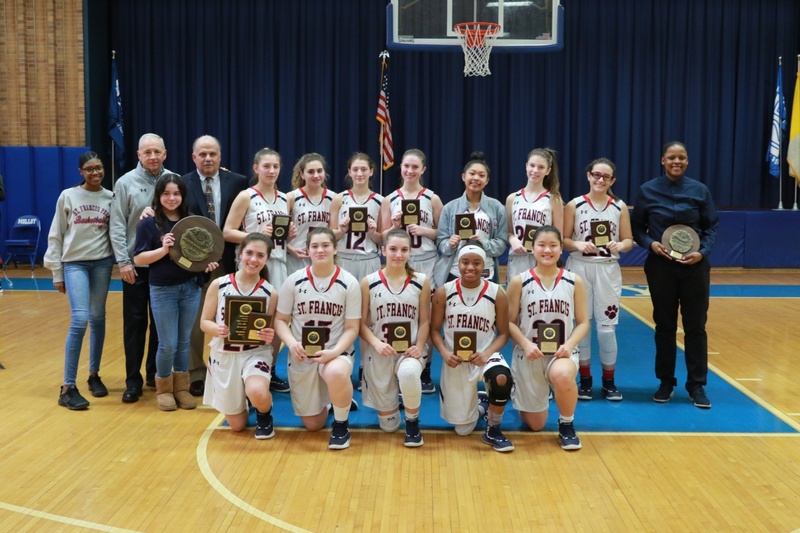 The Girls’ Junior Varsity basketball team had an incredible season. Playing in a highly competitive league, the girls finished with a league record of 13-1 and an overall record of 20 wins and only one loss! They went on to defeat Xaverian H.S. for the Brooklyn-Queens Championship and the right to take on Scanlon H.S. for the City title. Once again SFP prevailed and defeated Scanlon!! 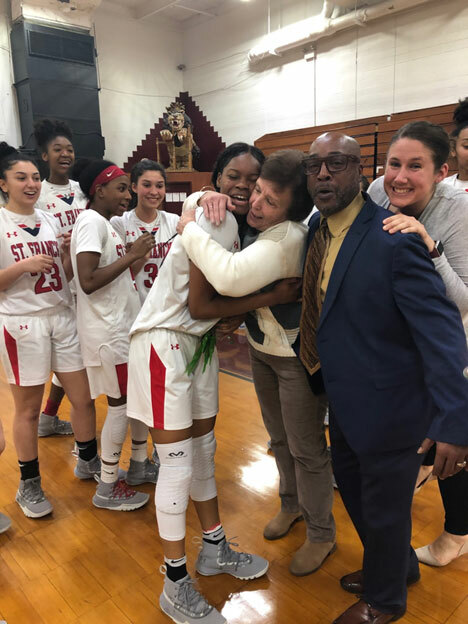 CONGRATULATIONS to Junior Mackayla Scarlett on scoring her 1000th point on Feb. 28th! This is a tremendous milestone achieved by only a select group of SFP premier athletes. 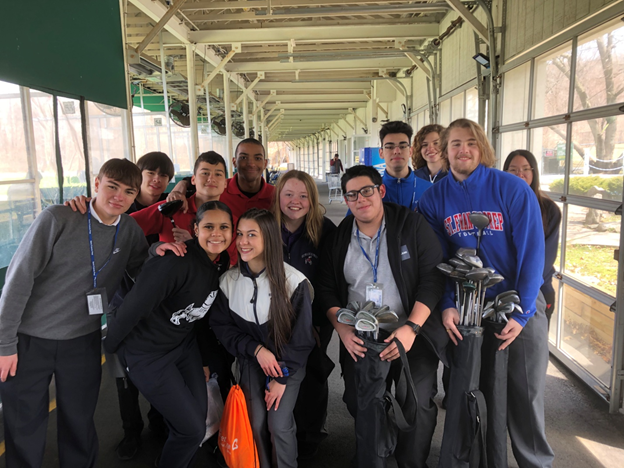 Mr. Colucci’s Golf Class enjoying a day at the Driving Range!